Webmoney is considered by many binary options and Forex traders to be one of the safest and most practical depositing methods available online today. Primarily used by Russian residents, Webmoney is adamant about security. The Keeper Classic wallet allows you to have higher limits and make bigger deposits, however you would need to download the software first. The Keeper Mini is a Web-based wallet that will allow you to make smaller deposits. 1%* of the transferred funds. Receiver is billed. 1% of the divided funds. 1%* of the value of the transferred funds. 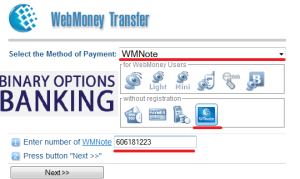 You can top up your Webmoney account by transferring funds directly from your bank account. It’s also possible to add or withdraw funds using your Visa or Mastercard. However, this is a special service which is used with Payspark, a payment provider offering unique virtual as well as ATM solutions. Outlets and Cash Desks: Fees range from 1.5% depending on the service and location. Services include funding points, cash items, points of exchange, verification centers and officers, dealers, postal offices, WM card & Funding Point of Sales. ATM’S: Cash out directly from your ATM – fees are from 1%. Via Your Bank Branch: Fee is from 0% depending on the sum. WM Note: WMnotes are issued and can only be redeemed by the Issuer. In a way its like a voucher which can only be used to fund your account with Webmoney. Available for Light, Mini, and Classic purses only. WM Cards: These are prepaid WMZ cards that can be used to fund your account. Postal Transfer: Top up your account through postal money transfers. Cash-in Terminals: You can ue processing terminals as well for funding. Webmoney Exchange Service: Locate an exchange service near you and send money. The binary options industry is starting to mature as regulation becomes a decisive factor in how trading is conducted. As time progresses deposit methods such as Webmoney will be come more prevalent and popular since they offer a great alternative for both brokers as well as traders.